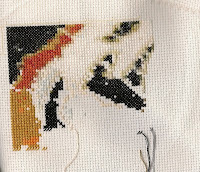 Nocturnal stitching is the most productive! I encourage anyone who can to stitch at night! LoL!! Thank you for stopping by my blog. I can't wait to see Tigress farther along. Looking good! I look forward to seeing the next update! Kelly and Beth Thank you both for your comments. Hope to share more of my work with you. And thanks for checking out my blog.